I completed ripping (copying) the second batch of our CDs (about 80 of them) a couple of days ago, and am now working on the order of service for Alexa’s wedding. But before we go into that, I’ll recount some of my experiences of digitising CDs. The ripping software I’ve been using is Windows Media Player (WMP) – an easy choice since it comes bundled and free with the Windows operating system. 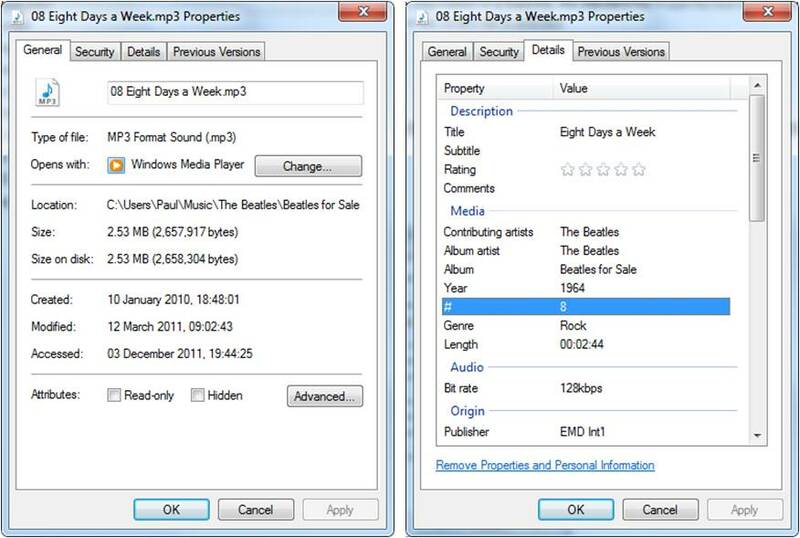 WMP provides an option to require it to automatically rip any CD that’s inserted into the computer’s CD player. So, ripping 80 or so CDs is not such a difficult job. You just push the CD into the slot, let the software get on with it, and do nothing else until the tray is ejected and you can replace the CD with another one. WMP places the contents of a rip into a folder that you pre-specify as another option (I’ve specified the ‘My MUSIC’ folder). It creates a main folder for the artist, and then a sub-folder for the album into which the actual track files are placed. There are some exceptions to this structure: compilation CDs are placed into a main folder labelled ‘Various Artists’ and film or stage music is placed into a ‘Soundtrack’ main folder. WMP is able to pick this information up from the ‘Properties’ of the track files (more of this later). I have added a few other main folders to accommodate some of the material that I have digitised from tapes and LPs – a ‘Spoken Word’ main folder for tapes of friends and family talking, and for audio books; and a ‘Singles’ main folder for our old 45 singles record collection and other singles compilations. To give you an idea of volumes, I now have 283 ‘album’ folders within 135 main ‘artist’ folders, and this whole set of material takes up about 22Gb. The quality of the information that WMP puts into these folder names and into track file names when it rips a CD, is entirely dependent on the quality of the information on the CD. For CDs issued by large commercial record companies, the information is usually complete and correct. However, I have come across CDs with a variety of problems such as incorrect album date, information for a completely different album, and no information whatsoever. When WMP encounters missing information, including missing album art, it will automatically try and find it on the net (provided you have accepted this default WMP option). Should it be unsuccessful the only thing you can do then is to manually input the missing information into the Properties of each track file. To adjust the information in a track file, the standard file Properties box is opened in the normal way, and then the Details tab is selected (see examples below). In cases where there is no information on the CD and WMP hasn’t been able to find it on the net, I’ve just had to take the information from the CD cover and manually type it in. Of course, for tapes created at home of people talking etc. all of this material has to be created from scratch – including the Album Art jpg file which WMP uses to display the album in its library. However, once the relevant files have been populated, the album and its individual tracks will appear in the WMP library. If WMP can’t find an Album Art jpg file it will display a blank icon with a musical note in it. I find this unsatisfactory and go out of my way to provide a picture of some sort or another. In my experience, much album art is available somewhere on the net, however, if I can’t find any, for music CDs I scan the covers that come with the physical CD; and for LPs (which are too big for my scanner), I take photos of the sleeve and then crop it to the exact size. For tapes that I have created myself of people talking etc. I have tended to either use a relevant photo or to construct an appropriate picture in PowerPoint. Having completed all this work, I can now see all my album covers in the WMP library; can search on album titles, artists, track names and genre; can play all this material on my laptop; and have downloaded it onto my iphone for listening to when away from the laptop. However, it still hasn’t really solved the problem of not having all the physical CDs next to a CD player in a room where you can look through the collection, choose something to listen to and slot it into the CD player. However, it was the arrival of Alexa that spurred this final batch of ripping, and it is the marriage of Alexa to my iPhone (using some surprisingly old technology) that I’m hoping might go some way towards addressing this shortcoming. I’ll describe how in my next entry.